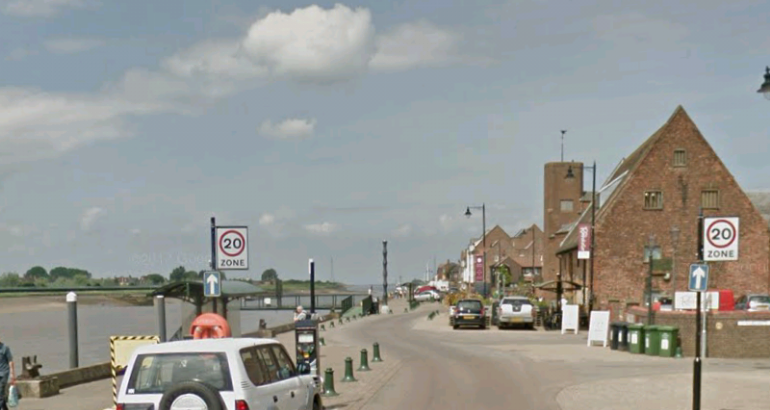 Kings Lynn was my home in the 1970s. 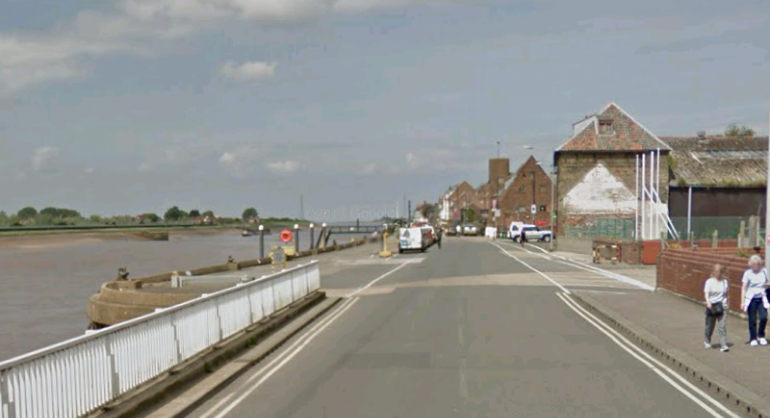 From the age of 12 to 18, I attended Kings Lynn Grammar School and lived on the East side of the town. 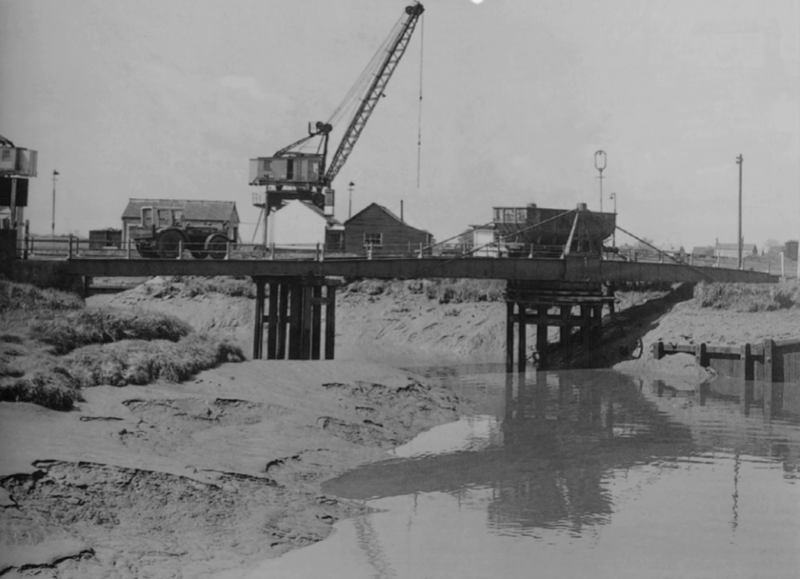 I have recently been reading some old railway magazines and came across an article about the Harbour Branch in Kings Lynn. The article was in Railway Bylines in January 2002. 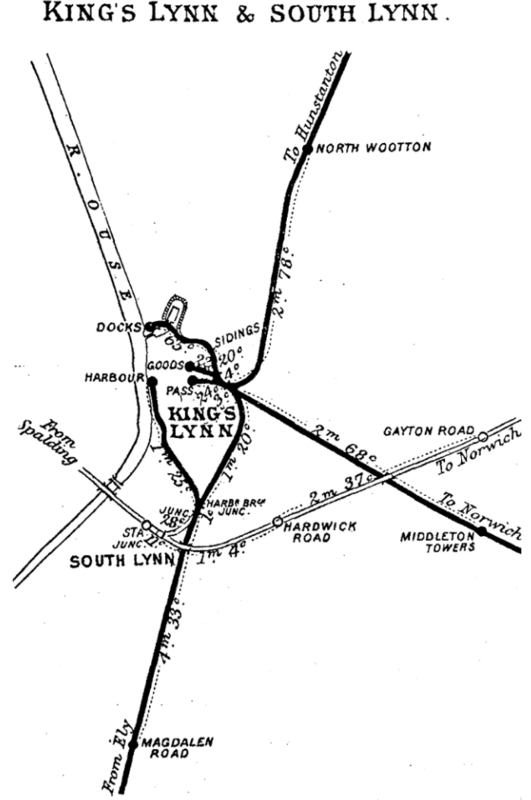 Kings Lynn was surprisingly included in the rail network early in the development of the UK network. 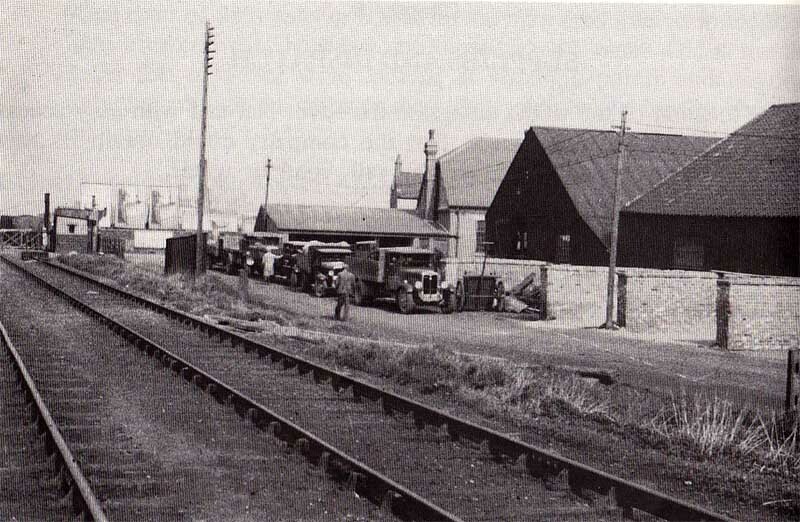 Services between Kings Lynn and Downham Market commenced on 27th October 1846. 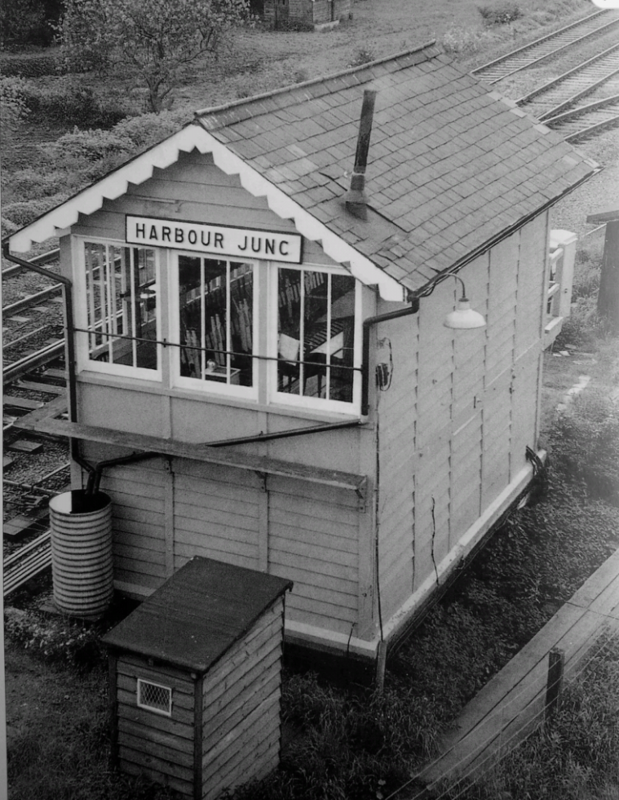 The Lynn & Ely Railway opened its harbour branch on the same date. It completed the coal handling facilities at the Harbour in May 1848. 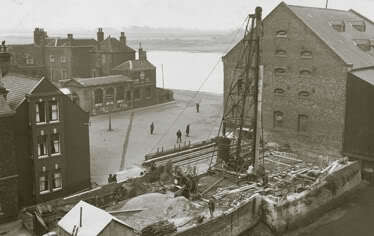 1849 saw an extension of the length of the branch as far as South Quay completed. 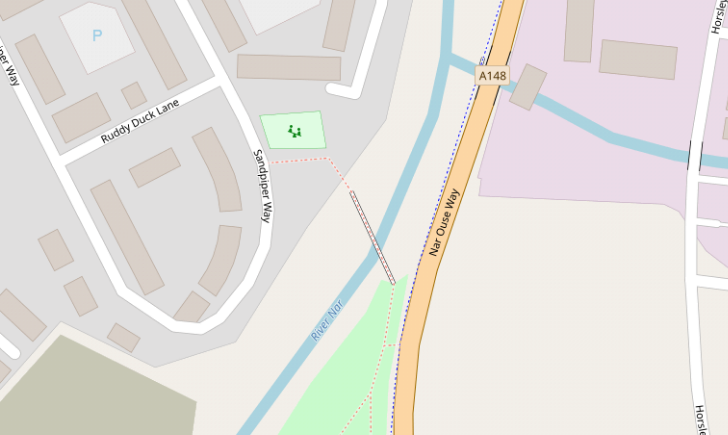 The branch diverged from the mainline to the north of South Lynn. 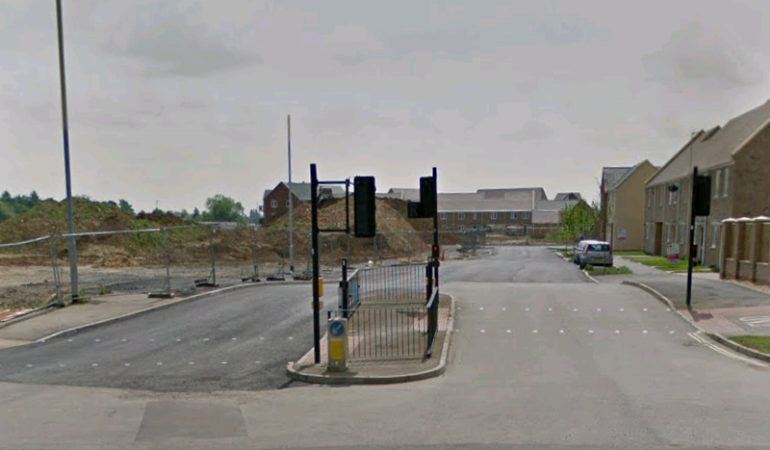 Looking South from Wisbech Raod along what was the route of the Branch and is now Sandpiper Way. 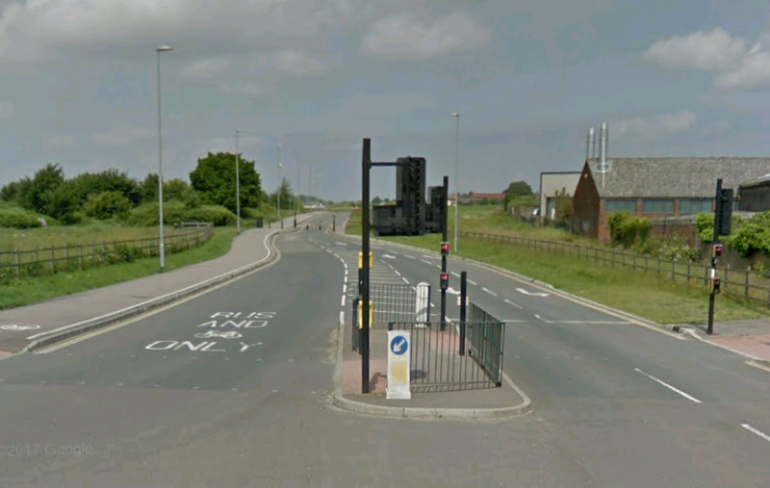 Looking North (above) from Wisbech Road along the old Harbour Branch which now forms Hardings Way.The coal sidings mentioned below would have been on the right-hand side of this image, to the left of the brick built building. 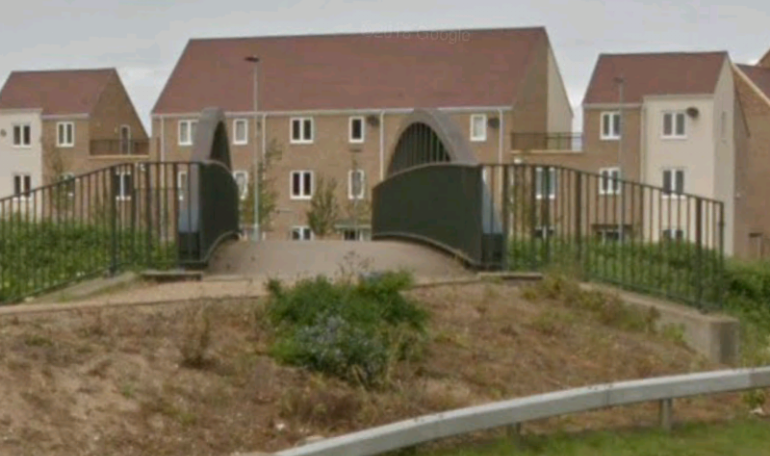 In the adjacent satellite image, the route of the Branch can be picked out by following a straight line from the footbridge at the southerly edge of the image through the building site to Wisbech Road and then along Hardings Way to the bridge over the River Nar at the northerly extent of the picture. 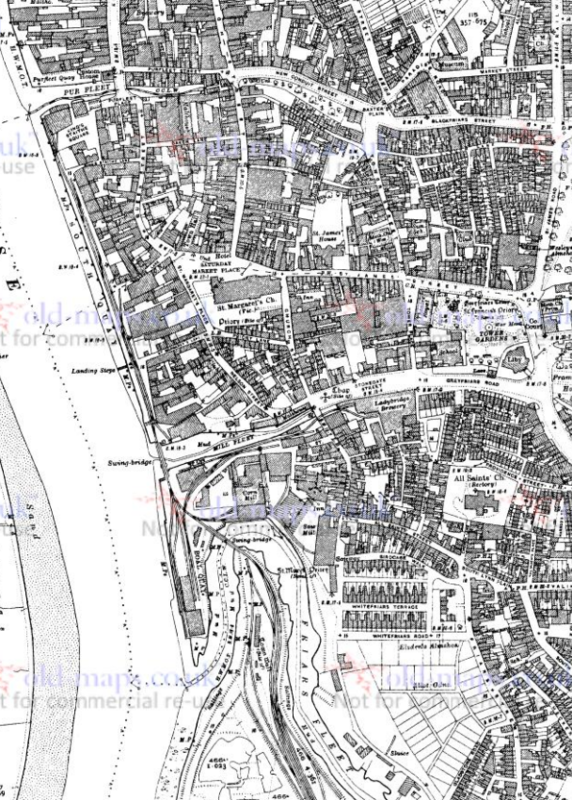 The tongue of land was connected to the remainder of the harbour on the banks of the River Ouse by a swing bridge which can be picked out easily in the map below. 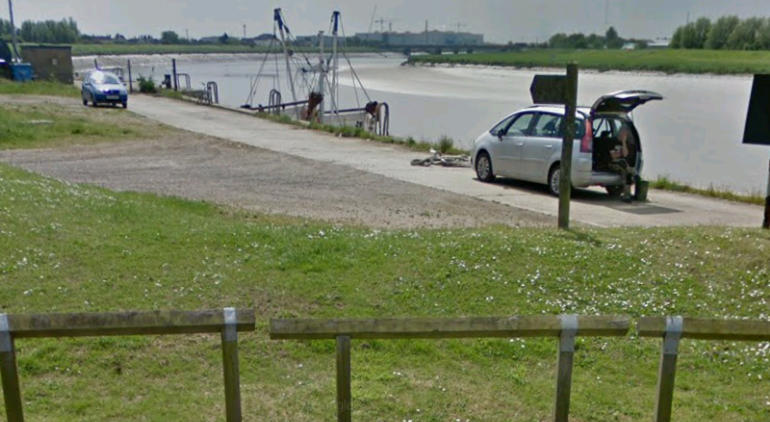 There was only a short distance at the neck of Boal Quay between Friars Fleet and Mill Fleet. 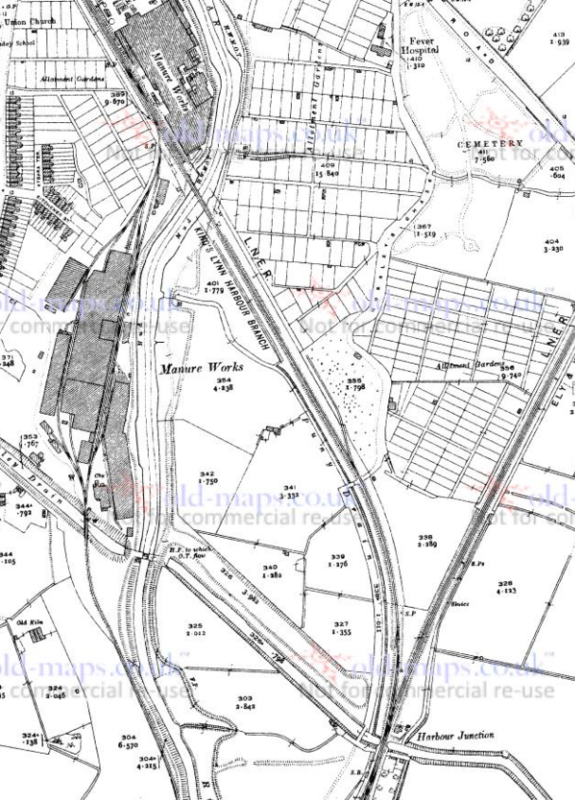 There were a number of short sidings which served Boal Quay and the adjacent Corn Mill. 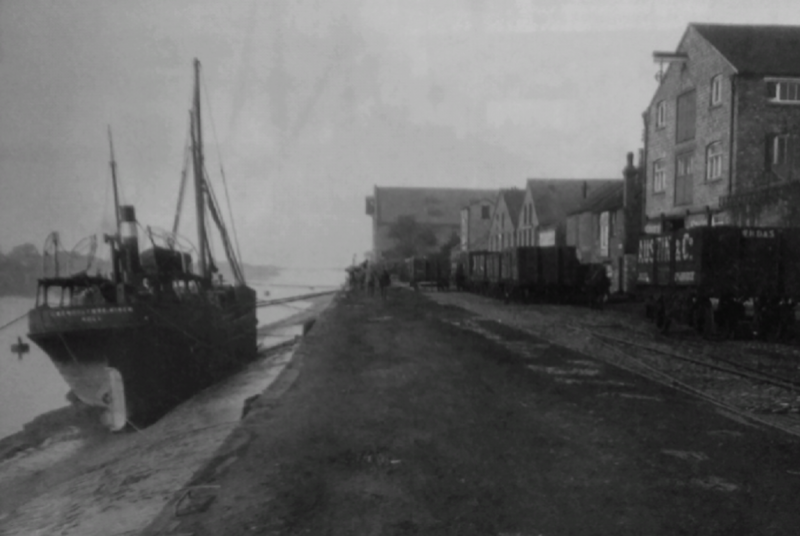 Boal Quay with clear evidence that the Quay was rail served. 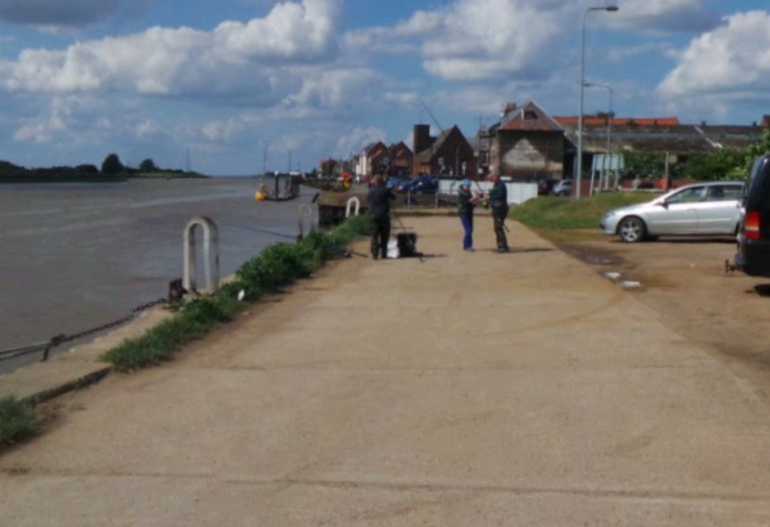 Boal Quay taken from West Lynn. The sidings seem to be full of open wagons. 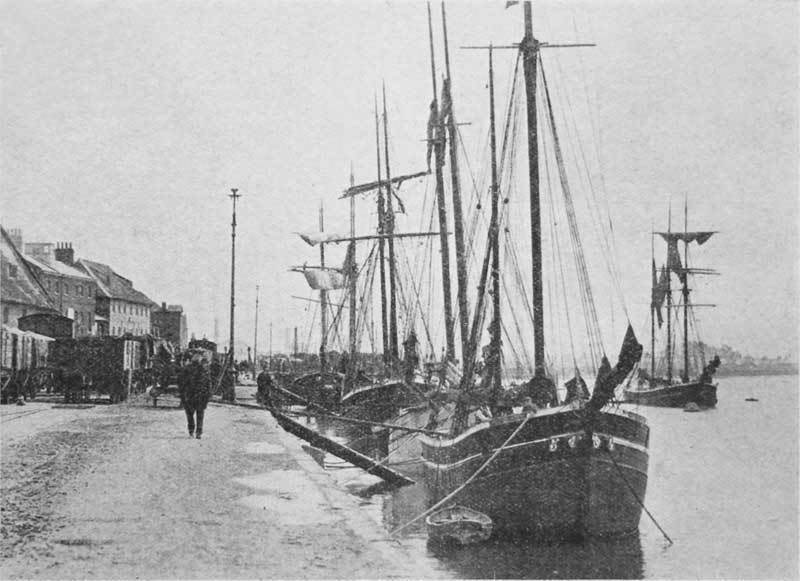 Boal Quay in the early 21st Century. A view looking North. Boal Quay – this time the view is looking South. 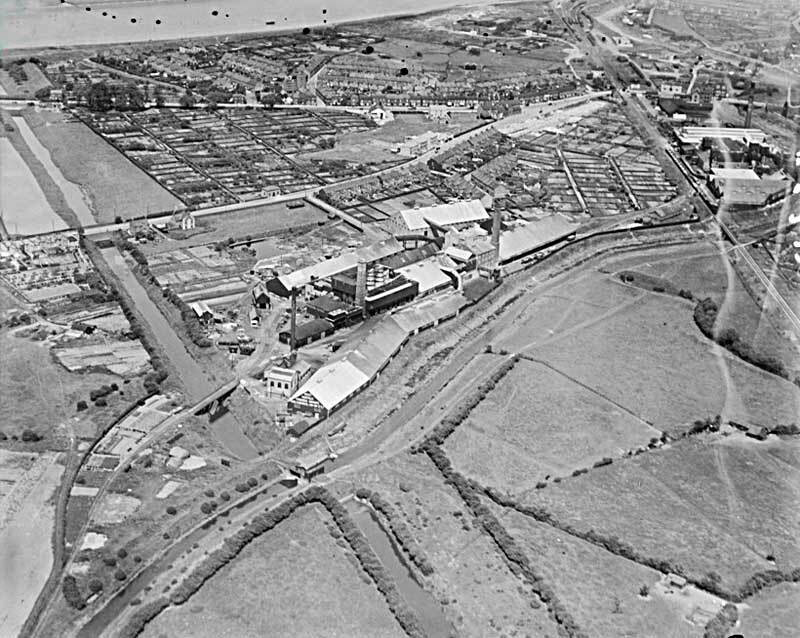 The satellite image clearly shows the old course of Friars Fleet and the shape of Boal Quay. 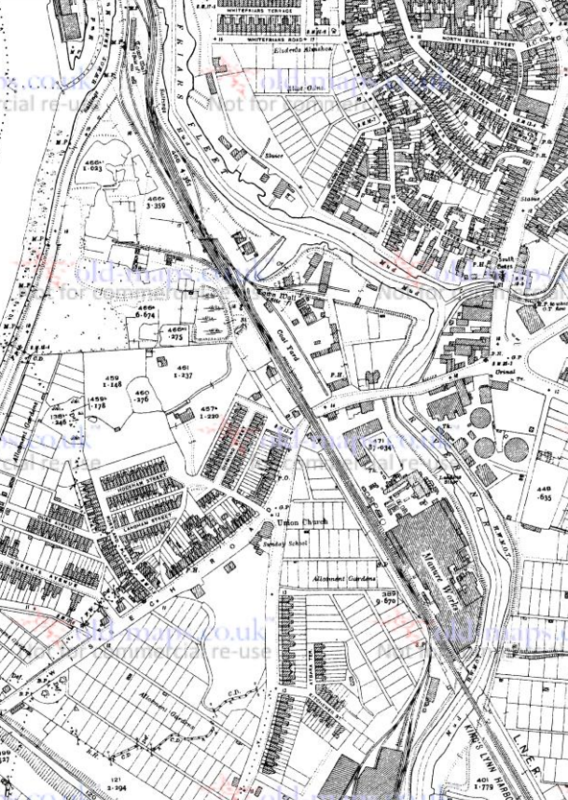 It also shows the full length of the South Quay from Mill Fleet to Purfleet. 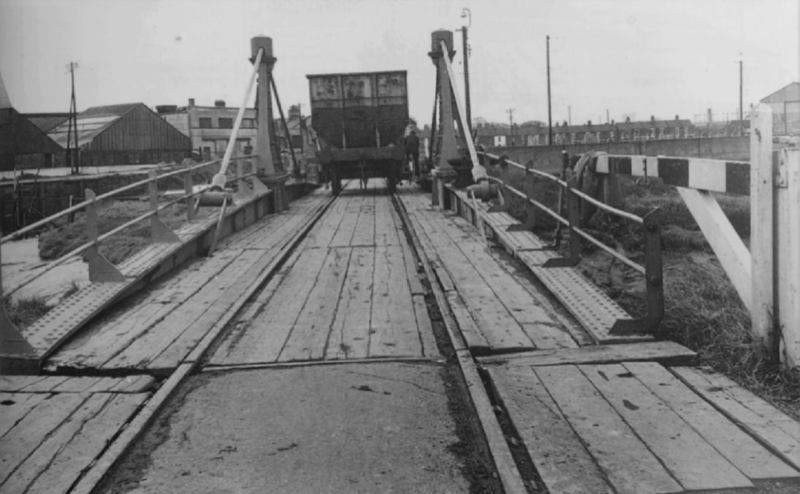 Another view of South Quay (below), taken on 18th May 1910. plenty of railway wagons are visible! 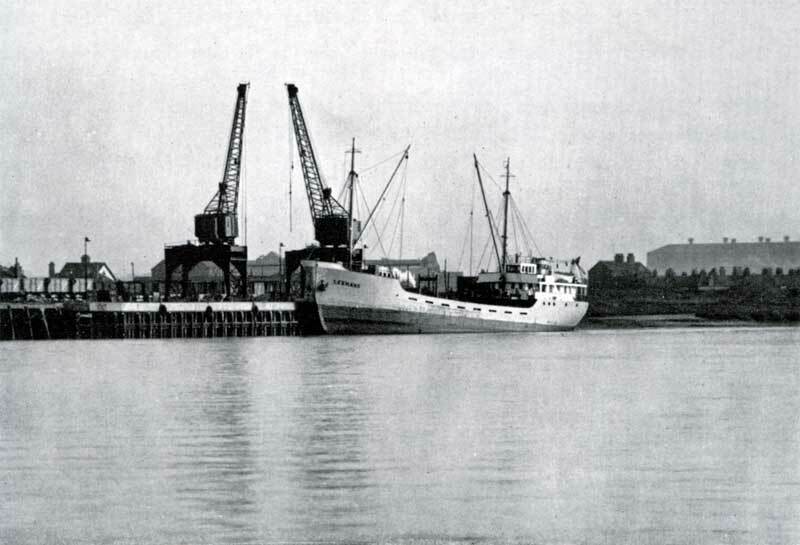 Motor vessel Gwendolynne Birch at low water alongside South Quay. 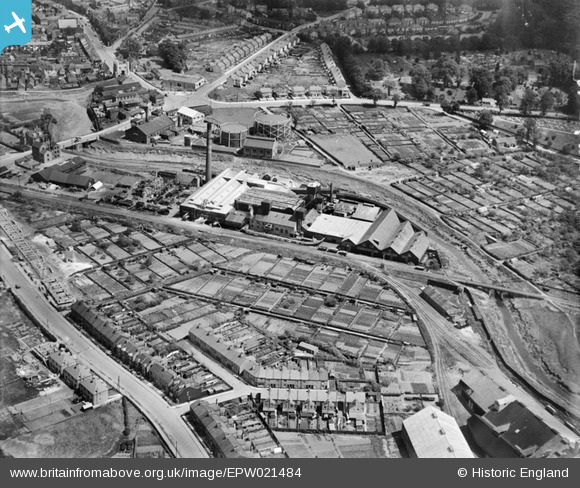 Scott & Sons furniture warehouse is on the right. 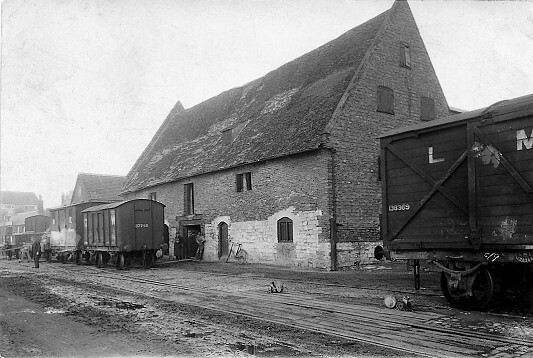 The first wagon on the right belongs to Austin & Co., coal merchants from Cambridge. 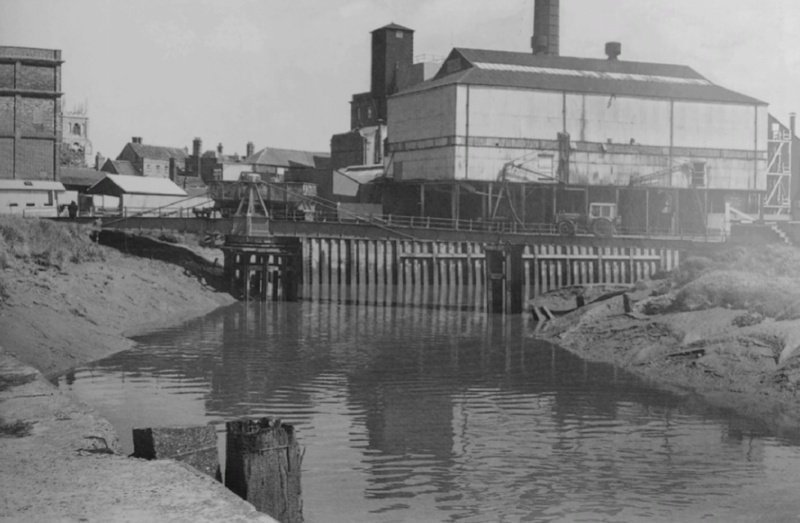 A modern view of South Quay taken from West Lynn and showing Marriott’s Warehouse! A modern view of South Quay with Marriott’s Warehouse on the right. 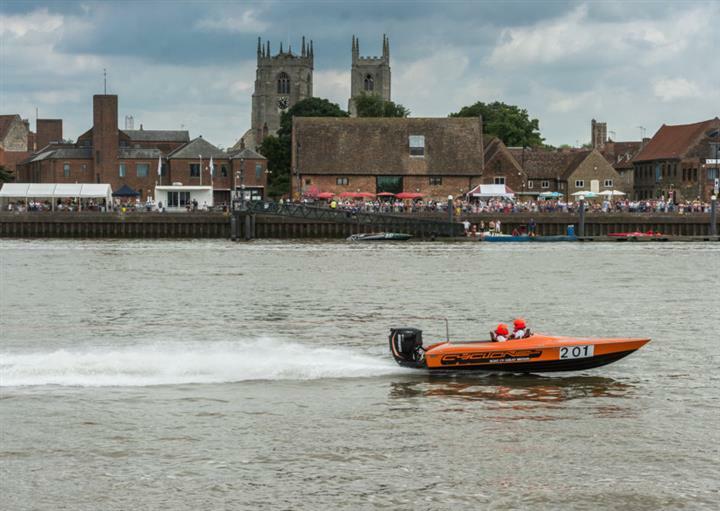 And finally, a view of the North end of South Quay in the early 21st Century. 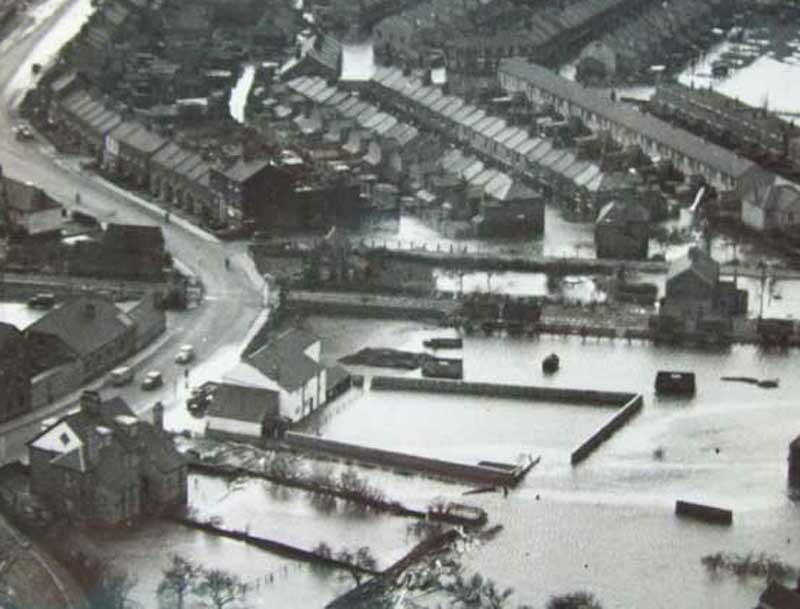 Flood protection measures are in evidence. 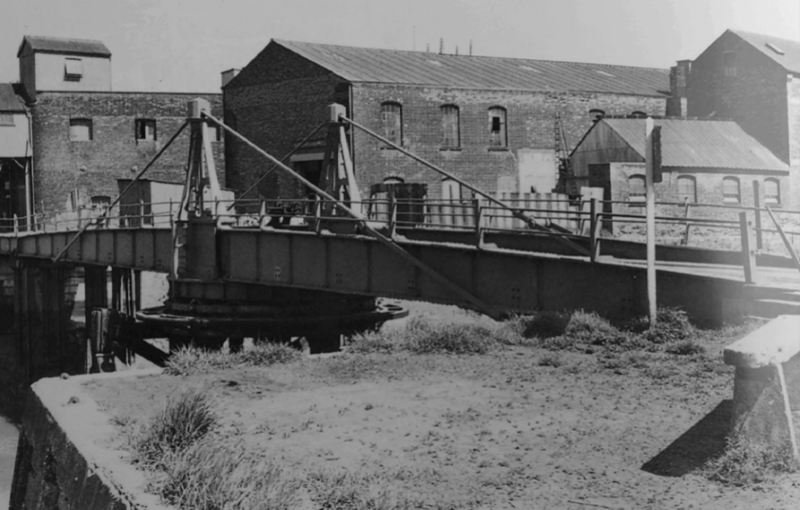 Bryan L. Wilson; Nooks, Crannies and Swing Bridges – Fixtures and Fittings on the Kings Lynn Harbour Branch; Railway Bylines, January 2002.
http://www.heritage.norfolk.gov.uk/record-details?MNF13593-Route-of-King%27s-Lynn-Harbour-Railway&Index=12729&RecordCount=57339&SessionID=35f84934-5757-4669-a3fc-9b20c56352a3, accessed on 15th September 2018.
https://www.old-maps.co.uk, accessed on 15th September 2018.
http://www.kingslynn-forums.co.uk/viewtopic.php?f=14&t=1470, accessed on 16th September 2018.
http://www.norfolkpubs.co.uk/kingslynn/nkingslynn/klnrt.htm, accessed on 16th September 2018.
https://www.old-maps.co.uk, accessed on 16th September 2018.
https://www.britainfromabove.org.uk, accessed on 16th September 2018.
http://www.kingslynn-forums.co.uk/viewtopic.php?f=14&t=157&sid=fe93ef8ae649a779d55f01b37425e368, accessed on 16th September 2018.
http://www.kingslynnonline.com/2014/04/lynns-port-and-railways-a-weekend-of-heritage, accessed on 16th September 2018.
http://www.kingslynn-forums.co.uk/viewtopic.php?f=14&t=218&start=15, accessed on 16th September 2018.
http://www.kingslynn-forums.co.uk/viewtopic.php?t=218, accessed on 16th September 2018.
https://www.lynnnews.co.uk/news/water-ski-races-bring-thousands-to-king-s-lynn-quay-1-8015320, accessed on 16th September 2018. Mike G Fell; An Illustrated History of The Port of King’s Lynn and its Railways; Orwell Press, Clophill, Bedfordshire, 2012.
http://www.kingslynn-forums.co.uk/viewtopic.php?f=14&t=273&start=150, accessed on 21st October 2018. 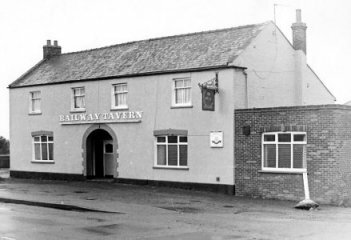 This entry was posted in Railways Blog on September 16, 2018 by rogerfarnworth. 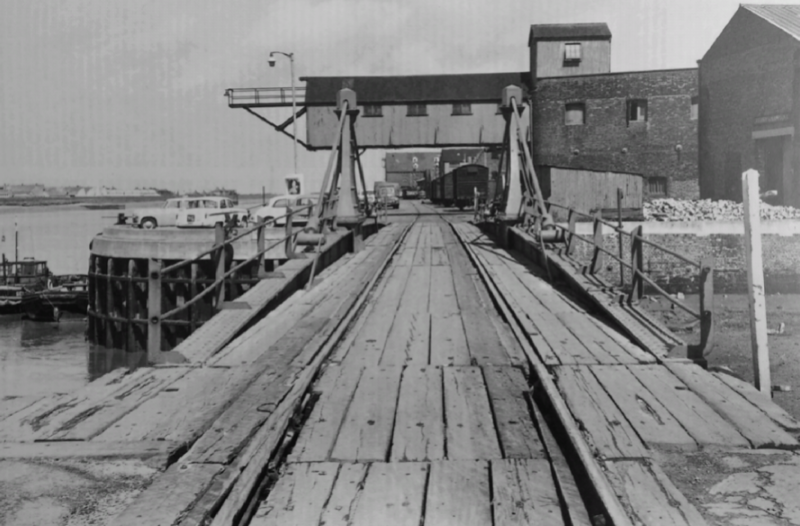 Wonderfully written and researched article on Kings Lynn Docks railways. 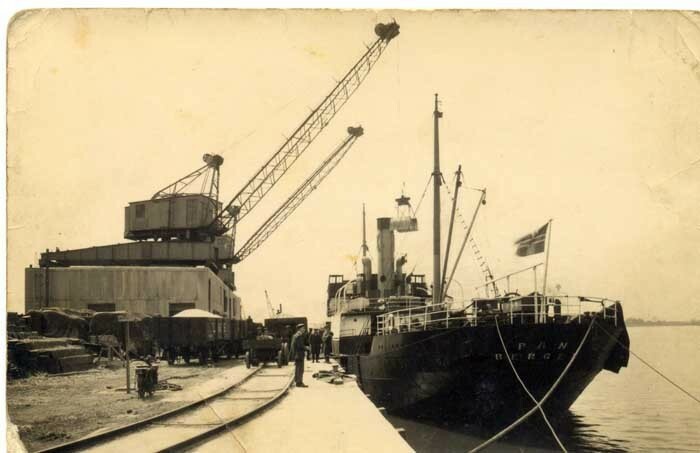 I Remember going to South Quay and Boal Quay during our holidays to Heacham in the 60s.We used to watch the cranes on Boal Quay unloading the Potash for the Fertilizer works and the wagons being shunted about by the Fordson tractor one at a time. I never saw any Locos though but there were some interesting variations of hopper wagons used all internal user.